Dawn is looking for the BLUE Micky Mouse version of this one. 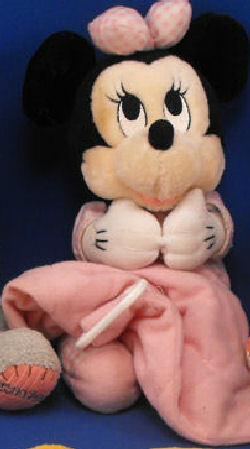 I’m looking for an Applause seated BABY MICKEY MOUSE in blue gingham check knit pajamas, holding a blue knit blankie. There is a crib pull handle and he plays BRAHMS. I’ve been searching for a replacement for approximately 5 years as a gift to my 14 year old son. He received the lovey as a gift right after he was born from a dear Aunt and kept it in his room even as he grew. I believe the Mickey was lost during our move and would love to find a replacement. For all of my children I have saved the baby items they treasured, with the hope they will one day share them with their children. Anything you can do to help would be greatly appreciated. this on ebay is without blankie… is it somewhere near what you’re looking for?